The galleries and displays provide the opportunity to explore Richmondshire’s history at first hand from Romans to Railways! Just one minute from the Market Place, the Museum is a treasure not to be missed. There is wheelchair access to all galleries via the main door. There are a wide range of items on display with the emphasis on local and social history. Displays include artefacts from the Stone Age to the present day, a Cruck House from nearby Ravensworth, lead-mining in the Dales, toys through the ages, a transport gallery with a superb model of Richmond Station, reconstructions of Grinton Post Office, Barker’s chemist shop from Catterick, the Herriot Set from the film All Creatures Great and Small and Fenwick’s grocers and chandlers shop (a reconstruction of the original shop in Frenchgate where J J Fenwick, the founder of the Fenwick business empire was born in 1846 in the town). The new Discovery Centre, opened in 2012 is an interactive educational resource which, when not being used for school groups, is an interesting public gallery that explores life in Richmond Market Place in 1870. 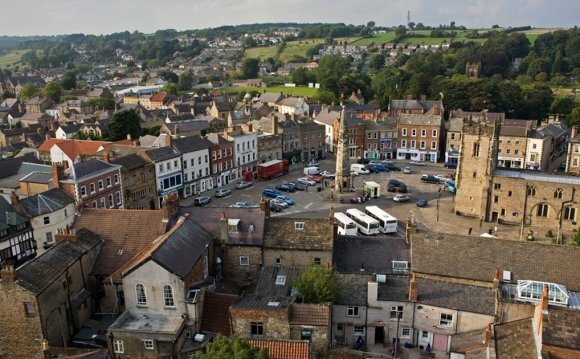 As well as maintaining a wide collection of historic artefacts ranging from the earliest periods of life in Richmondshire the Museum has an active educational role supporting primary and secondary schools and providing workplace experience for university students. The Museum is also an archaeological repository; interested parties should contact the Museum for further details and for archaeological depository arrangements . The Wenham Study Centre on the first floor provides a well resourced facility for the variety of Workshops, Lectures, Educational visits and Research advertised and held there every year. Family history enquiries are welcome.